JList represents a list of items. You can select one or a number of items from the list. JList can generate the list selection event so you need to implement the ListSelectionListener interface to receive the event. This interface has a method called valueChanged(ListSelectEvent e) that needs to be overridden. Below are the summary of JList constructors and its useful methods. creates a list with a list mode that maintains the list items. creates a list that its items are taken from an array of items array. creates a list that its items are taken from the vector items. returns the index of the selected item. returns the array of selected indices. returns the array of selected items. returns true if the item at the specified index is selected. 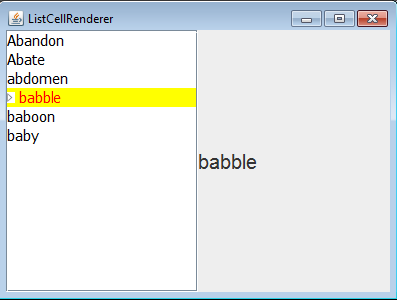 specifies the cell render for the list. specifies a value to be the height of every cell. specifies a value to be the width of every cell. specifies the data items of the list. selects a single cell at the specified index. selects multiple cells at the indices. selects an item from the list. Other useful methods are not in the JList class. They are in the DefaultListModel class. It is a list model class that implements the ListModel interfaces. adds an item to end of the list. removes all items of the list. Tests whether or not an item is in the list. returns the element at the specified index in the list. 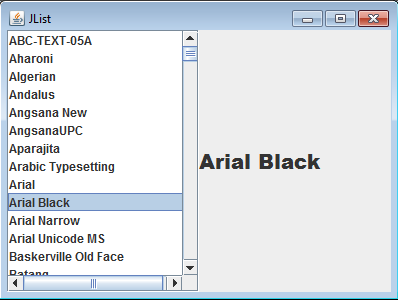 delete the item at the specified index of the list. delete the specified item of the list. converts the list to an array of objects. ListCellRenderer interface specifies components that will be used to render the cells of the list (created by JList class). For example, a class that implements the ListCellRender interface can specify labels to render the cells of the list so you are able to apply the font name, font size, text color, and background color, and image icon to the cells of the list as you do with the labels (created by JLabel class).